San Francisco and “Silicon Valley” may first come to mind when imagining the home of big internet companies, but the physical beating heart of the internet in fact lies on the East Coast, in what has become known as “Data Center Alley” in Northern Virginia. Located just outside Washington, D.C., Data Center Alley is already home to the world’s highest concentration of data centers in the world and is dramatically expanding. Loudoun County Virginia, the center of Data Center Alley, claims 70 percent of the world’s internet traffic passes through its borders. Data centers serve as factories of the information age; their 24/7 operation makes online browsing, streaming and communication possible, but delivering all this data requires a tremendous amount of electricity. The explosive demand of internet-based platforms and services has fueled a dramatic expansion in both the size and number of data centers, making them collectively one of the largest sources of new electricity demand globally. While the internet itself has a global reach, this rapid expansion in data centers has not been evenly distributed, but instead highly concentrated, causing a significant increase in local electricity demand. Given the urgent need to transition away from fossil fuels as rapidly as possible to combat the most extreme consequences of climate change, the source of electricity deployed by the local utility in these data center hotspots takes on global significance. Since 2010, Greenpeace has regularly documented the rising global energy footprint of data centers, challenging and benchmarking whether global internet platforms and major data center operators power their operations in a way that accelerates the transition to renewable energy or instead fuels climate change by increasing the demand for coal, gas and oil. During this time, more than 20 of the largest internet companies including Facebook, Google and Apple have established public commitments to power their digital infrastructure with 100 percent renewable electricity, which has already resulted in the deployment of more than 10 gigawatts of renewable energy in the U.S. and abroad. Because of the desirability as a customer to electric utilities, these commitments have also caused many local utilities to significantly shift their investment to renewable electricity generation in order to meet the needs of existing data center customers or remain competitive for attracting new investment. The Greenpeace Airship A.E. 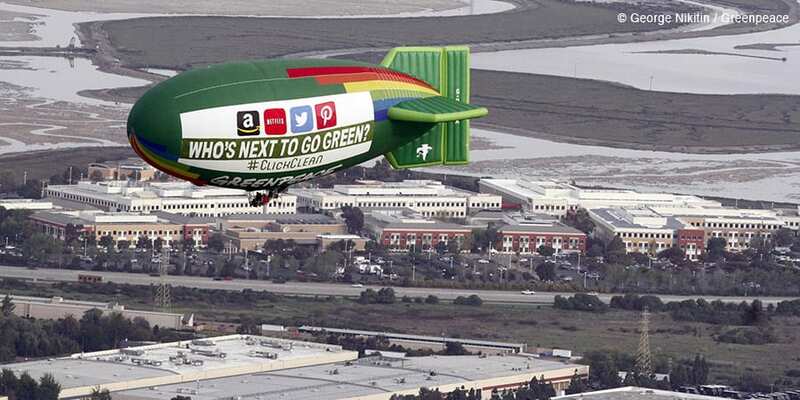 Bates flies over Silicon Valley in 2014 with a banner asking "Who's The Next To Go Green?" As top climate scientists have warned, we must rapidly phase out fossil fuels and transition electricity generation to renewable sources during the next 12 years to stay below the maximum 1.5 degrees Celsius of total warming permitted to avoid further catastrophic impacts. With the tremendous amount of energy needed to power data centers and their rapid growth, how we power this digital infrastructure is rapidly becoming critical in determining whether we will be able to stave off climate change in time to avoid planetary catastrophe. Despite significant new investment in renewable generation by utilities in other data center hot spots such as Iowa, the dramatic expansion of Virginia’s Data Center Alley continues to fuel and increase demand in coal and natural gas. At present, power generation in Virginia is dominated by fossil fuels, with less than 5 percent coming from renewable sources, lagging far behind other regions. 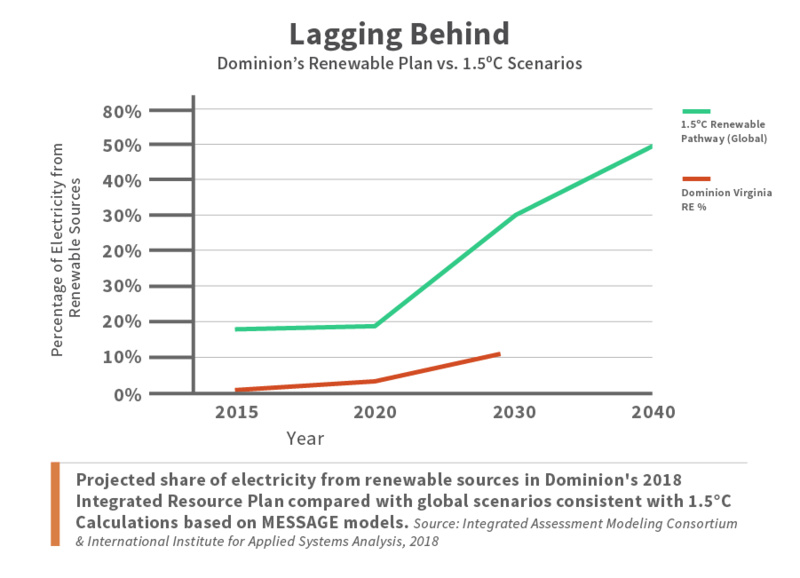 Dominion Energy, Virginia’s largest electricity provider and the primary electric utility for Data Center Alley, has strongly resisted any meaningful transition to renewable sources of electricity, currently representing only 4 percent of its generation mix, with plans to increase to only slightly over 10 percent by 2030. Growing Electricity Demand: While electricity demand for utilities is flat or declining, electricity demand from data centers in Virginia has grown sharply, between 9 and 11 percent each year, offsetting declines elsewhere, with data center demand regularly touted by Dominion to its investors as a sign of continued growth. Justification for new fossil fuel investment: Even though five out of Dominion’s largest 20 customers are data center companies that have committed to becoming 100 percent renewable, Dominion continues to dramatically expand its reliance on fracked gas as it retires older coal plants, rather than transition to renewables. In fact, Dominion has used rising data center demand to justify significant new investments in natural gas supply and generation capacity, most notably the $7-billion Atlantic Coast Pipeline (ACP), which will deliver fracked gas into Virginia and North Carolina. If allowed to go forward, the ACP will further lock Virginia into a reliance on fracked gas, taking it in the opposite direction from where its emissions need to be to support a carbon pollution pathway in line with 1.5 degrees of warming. Dominion’s lack of renewable energy supply and insistence on making significant new investments in fossil fuels will both delay Virginia’s transition to cleaner sources of energy, and make it much more costly to do so. Yet many of the largest data center companies with commitments to 100 percent renewable energy have continued to rapidly expand their presence in Virginia, thus fueling even more demand for dirty electricity, with Amazon Web Services the biggest culprit. Amazon Web Services (AWS) already ranked as one of Dominion Energy’s largest electricity customers when it made its commitment to 100 percent renewable energy in late 2014, and Greenpeace‘s analysis shows AWS has tripled its data center operations in Virginia since that time. Even though AWS did add a sizable amount of renewable energy locally from 2015 to 2016, its dramatic growth in Virginia during this period continued to far exceed the additional electricity supply from its renewable projects. 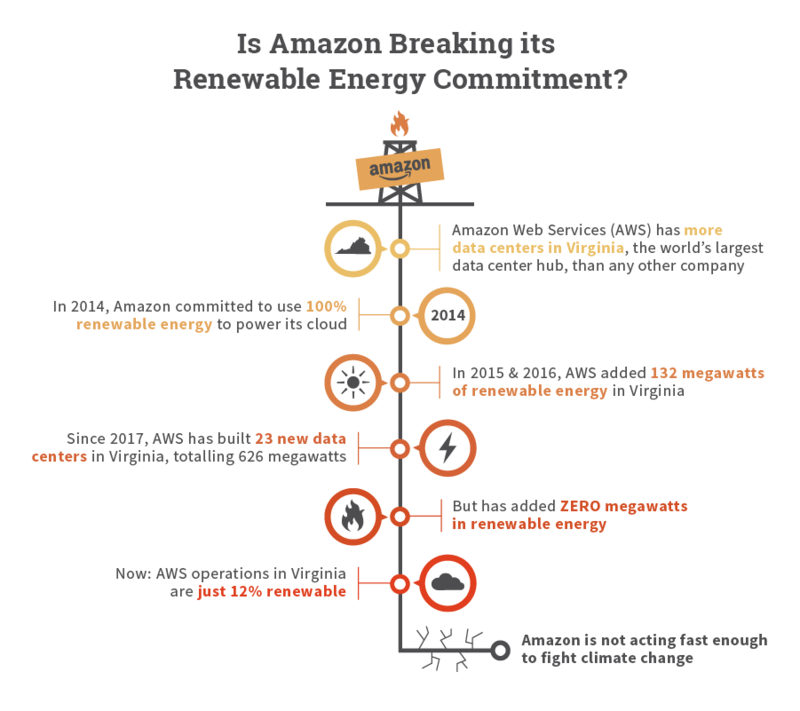 Since 2017, AWS appears to have turned its back on its 100 percent renewable commitment, increasing its already massive operations in Virginia by 59 percent, without any additional renewable energy supply. In fact, due both to its dominant market share among cloud computing platforms and the concentration of roughly half of its facilities in Virginia, AWS itself is an unknowing silent partner in Dominion’s growth strategy, due to the gravitational effect created among other data center operators who want to tout to their customers a direct connection to AWS’s massive Virginia operations. 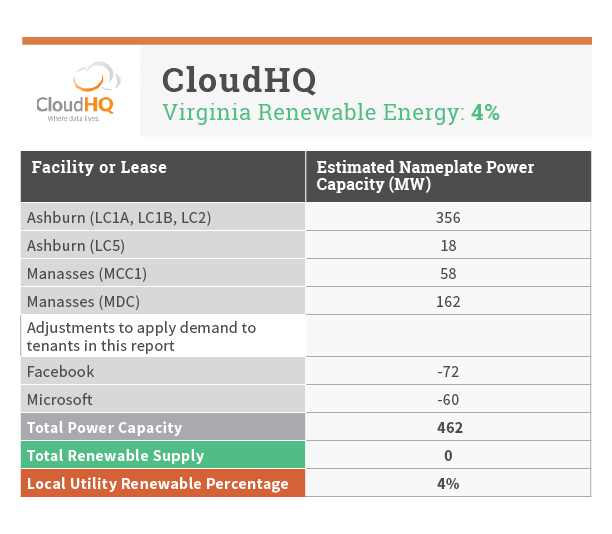 Of the 13 companies in this report that operate their own data centers in Virginia, only Facebook and Microsoft have shown some success in securing a significant supply of renewable energy in Virginia. If Amazon and other internet companies continue their rapid expansion of data centers in Virginia, but allow Dominion to continue with its strategy to use rising data center demand to justify significant new investment in fossil fuel infrastructure, they will be responsible for driving a massive new investment in fossil fuels that the planet cannot afford. The rapid growth in energy demand from the IT sector in Virginia is occurring at the exact same time that we need to be urgently transitioning global energy consumption to renewables. Without intervention from data center operators in Virginia, the internet will continue to drive carbon emissions with every click, swipe and share. Electricity demand from data centers in Virginia continues to grow at a dramatic rate, with the total power demand of existing data centers and those under development approaching 4.5 gigawatts, or roughly the same power output as nine large (500-megawatt) coal power plants. Amazon Web Services (AWS), who has built the core of its global infrastructure in Virginia, is by far the biggest driver of this growth, with 1.7 gigawatts of power demand across 55 Virginia data centers operating or under construction, representing an increase of nearly 60% in the past two years alone. Tech giants like Amazon have made promises to power their data centers with renewable energy, but a closer look into the heart of the internet reveals their rapid growth is driving more investment in fossil fuels. Dominion Energy is using the rapid data center growth in Virginia from Amazon and other tech giants as an excuse to build more fossil fuel infrastructure—like the Atlantic Coast Pipeline—locking both major IT brands and the Commonwealth of Virginia into more fossil fuels when both should be rapidly transitioning to 100 percent renewable energy. Having added over 600 megawatts of additional data center capacity in Virginia and zero additional renewable energy supply in the past two years, AWS no longer appears to be honoring its commitment to 100 percent renewables. Despite 100% renewable commitments that have had significant impact in driving renewables in other markets, Virginia is an important reminder that utilities will only begin to scale up renewable generation when large customers seriously pursue their commitments—either by pushing for stronger renewable energy policies locally or by choosing to site facilities only in places with high levels of renewables. IT giants who are serious about putting their operations on a pathway to avoid dangerous climate change must use their influence to change the rules that govern energy investments of incumbent utilities like Dominion to drive a rapid transition away from fossil fuels to renewable sources of electricity. The internet has rapidly spread across the globe over the last 20 years, now appearing on demand via smartphones, tablets and laptops wherever in the world it is needed. If you were looking for the beating heart of the global internet that powers our lives, Dulles International Airport, just outside of Washington, D.C., provides a clear marker of the epicenter of the physical internet. Fanning out from the airport in almost all directions across converted farmland that once marked the earliest battles of the U.S. Civil War is the world’s largest concentration of data centers: massive, nondescript buildings filled with computing equipment that serve as the factories of the digital economy. Between Loudoun, Fairfax and Prince William counties, Northern Virginia is home to more than 100 data centers and more than 10 million square feet of data center space. Loudoun county alone claims it handles as much as 70 percent of the world’s internet traffic on a daily basis. Telecommunications infrastructure facilitating rapid data delivery, available land and cheap electricity developed northern Virginia into the digital epicenter it is today. While the recent growth in larger data centers can be partially attributed to tax incentives offered by the state of Virginia, the presence of the largest piece of AWS’s global infrastructure is itself creating a gravitational effect on other major data center operators, who want to be able to market their operations as having a direct connect to AWS. The recent arrival of new high speed subsea data connections to Europe and Africa from Virginia Beach is now attracting major new data center investment in Henrico as well as in southeast Virginia. Northern Virginia represents that heart of the physical internet. It’s now home to more than 100 large data centers like this one in Ashburn, Virginia. Dedicated facilities that power internet platforms such as Facebook or Google. Cloud computing data centers that sell computing power and storage (e.g. AWS, Google, Microsoft) to a range of customers large and small. Colocation data centers: operated by digital “landlords” (e.g. Digital Realty, Equinix, RagingWire) that lease out large pieces of data center space to host the servers for other IT companies such as Apple, Salesforce and Uber, as well as smaller pieces to non-IT companies. Not only is the data center market in Virginia the largest in the world, but it’s also growing faster than any other region. In the first half of 2018, new multi-tenant colocation data center construction in Virginia was greater than construction in the next four largest areas combined, according to commercial realtor Jones Lang LaSalle (JLL). In total, JLL estimates 645 additional megawatts of planned or under-construction colocation capacity in the next year. Dominion Energy has estimated its energy sales to data center customers to grow roughly 10 percent a year through 2021, adding a predicted 2.4 terawatt hours of demand. Not including government data centers, we estimate the potential electricity demand of both existing data centers and those under development in Virginia to be approaching 4.5 gigawatts, or roughly the same power output as nine large (500-megawatt) coal power plants. This explosive growth of data centers and the source of energy that powers them is a critical question in whether we will be able to transition to renewable energy in time to avoid the worst impacts of climate change. Storing, moving, processing and analyzing data all require energy, as does the cooling of the buildings so the heat-generating servers don’t overheat. Even with energy efficiency efforts, if coal and other fossil fuels are used to power data centers, their continued dramatic growth produce a significant increase CO2. In 2016, Virginia generated less than 2 percent of its energy from renewable sources, while the rest came from gas (49 percent), coal (12 percent) and other non-renewable sources. Virginia electric utilities, including Dominion Power, and other smaller electricity co-ops including Northern Virginia Electric Cooperative (NOVEC) and Rappahannock Electric Cooperative, offer renewables as a very limited part of their energy mix. A Data Center construction project in Ashburn, Virginia. Most of the data centers in Northern Virginia rely on Dominion Energy for electricity, which is only 4% renewable. Virginia is primarily a regulated electricity market, which means customers have limited choice in what type of energy they purchase and from whom they purchase. With only limited exceptions, the energy mix of residential and commercial customers, including data centers, will match the energy mix of their local utility. This means that the majority of rising electricity demand needed to power data centers in Virginia is driving even more demand for fossil fuels, and more CO2 emissions that are fueling global warming. The world’s top climate scientists recently warned that global temperatures must be kept to a total increase 1.5C or lower in order to prevent extreme climate change impacts from occurring, requiring a halving of global emissions by 2030 to stay within this threshold. For Virginia to reduce its greenhouse gas emissions in line with this scientific mandate, it’s essential for its grid to rapidly decarbonize in the next decade. However, the 15-year pathway laid out by Dominion Energy in its latest integrated resources plan (IRP) is pointing Virginia in the opposite direction. 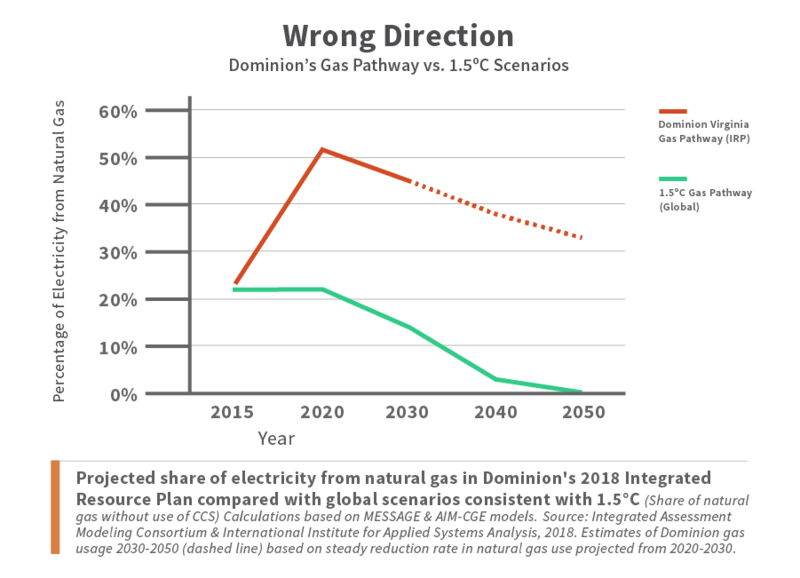 The charts below highlight the disconnect between the pathway being put forward by Dominion that dramatically increases the state’s reliance on natural gas, and the rapid transition to renewable energy that global climate models say must occur to stay within 1.5 degrees. Since 2012, more than 20 major tech companies have committed to power their global operations with renewable energy. Acting on these commitments, the tech sector has collectively already added 10 gigawatts of renewable energy to the grid globally since 2010. However, very little of this progress is happening in Virginia where most of the data center electricity is produced. Companies with 100 percent RE commitments find when they break ground in Virginia that their options for RE are very limited. 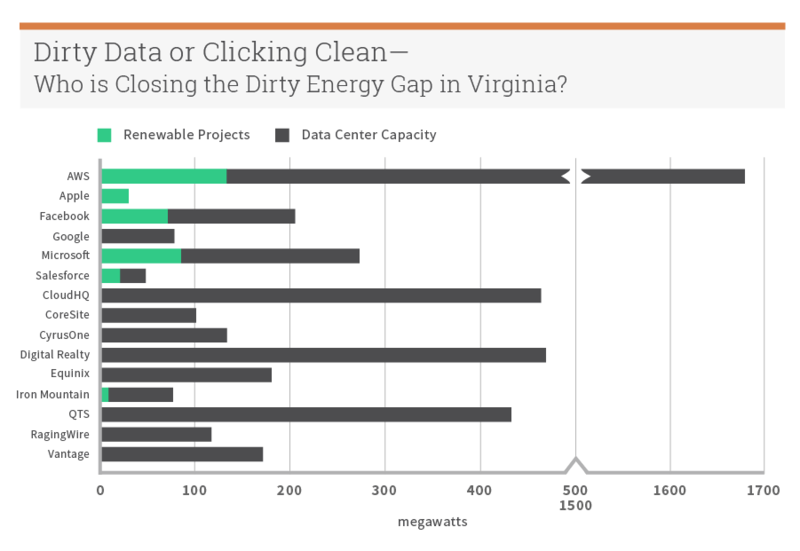 As Virginia is primarily a regulated energy market, data centers have few options for buying a renewable supply of energy if not offered by the local utility. Some companies work around this by purchasing excess renewables from other regions where it’s relatively abundant or by simply purchasing renewable energy credits (RECs). However, neither of these options improves the energy mix of Virginia or influences future direction and is therefore not ideal for those companies concerned with meaningfully reducing their operational carbon emissions. Of the 15 companies measured in this report, only Apple has invested in enough renewable energy procurement to match its demand in the region. Facebook and Microsoft have also shown notable efforts in deploying increasing amounts of local renewables as they scale up operations in Virginia. The remaining companies have energy demand that either far outstrips their supply of renewables(Amazon, for example) or have not deployed any local renewables at all (most of the colocation companies). 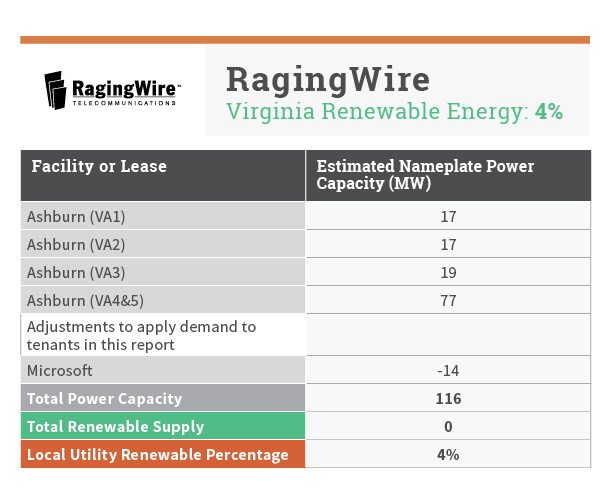 Note on Virginia Renewable Energy Percent: In addition to giving companies credit for their renewable energy projects in Virginia, we gave each company an additional 4 percent renewable energy to reflect residual renewable supply from Dominion’s grid mix. A limited number of the facilities in this report fall outside of Dominion’s territory, e.g. in NOVEC’s territory where residual renewable supply is only 0.05 percent, however, we have applied 4 percent across the board given that current service area maps and information on smaller coops’ grid mixes are not readily available to the public. For more information see Methodology section. Dominion Energy, Inc., is one of the largest producers and transporters of energy in the U.S., providing electricity to some 7.5 million homes and businesses in numerous eastern states and elsewhere. In Virginia, Dominion serves 2.5 million customers, or roughly two-thirds of the state, and operates 13 gas power stations and 6 coal plants, with only a 4 percent supply of renewable energy. In recent years, Dominion has been increasingly investing in gas generation, evidenced by the shift in energy production in the Commonwealth from 7 million megawatt hours in 2006 to 40 million in 2016. Recruiting data centers to Virginia has become a central pillar of Dominion’s long-term strategy to drive growth in electricity sales, with progress regularly reported to its investors. While most of Dominion’s other customer segments show gradually declining demand due to improvements in energy efficiency, the 9 to 12 percent annual growth rates in electricity consumption from data centers offset this decline and allow Dominion to continue to report increased sales to its investors. 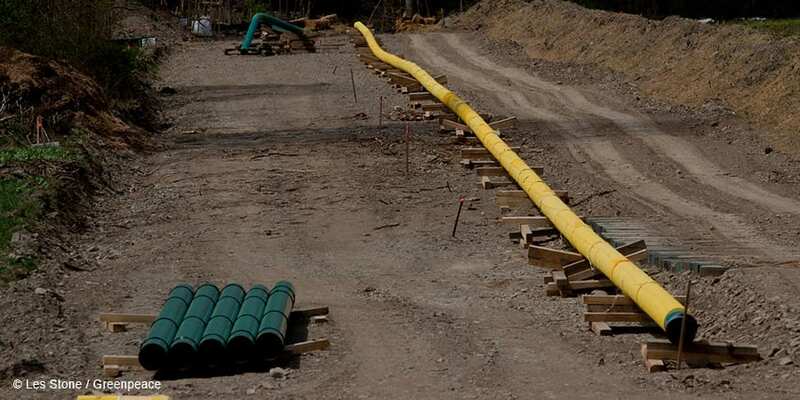 Pipeline construction to support gas drilling operations in the Marcellus Shale region. Dominion has in turn used the rapidly growing electricity demand from data centers in Virginia as a central justification for the construction of a $7-billion new fracked gas pipeline. (See section on Atlantic Coast Pipeline.) 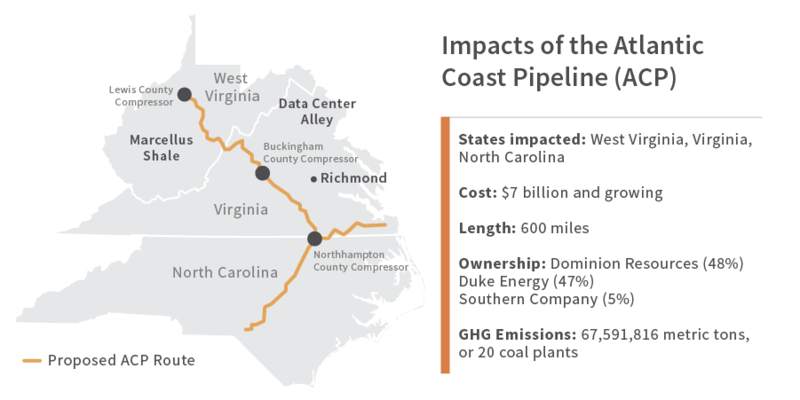 Dominion is depending on the guaranteed rate of return for Atlantic Coast Pipeline (ACP) as an important new revenue driver for the company in 2019 and beyond, as it expects to pass the costs of its construction on to ratepayers over the next 20 years. But if the ACP is allowed to be completed, Dominion will have been successful in using demand from data centers to lock both data center companies and other Virginians into a long-term reliance on fracked natural gas at the exact moment we need to be urgently transitioning our electricity grid to renewables. Dominion’s projected demand for the pipeline ignores the fact that six of its 20 largest customers, five of which are data center operators, have made commitments to run on 100 percent renewable energy. Yet in its 2018 Integrated Resources Plan (IRP), Dominion lays out several plans for meeting Virginia’s energy needs, all of which keep Virginia primarily powered by dirty sources of electricity for years to come. The Atlantic Coast Pipeline (ACP) is a proposed interstate natural gas pipeline that would transport Marcellus-Utica shale gas from West Virginia 600 miles through Virginia and North Carolina. The pipeline would also include three new gas compressor stations in Lewis County, West Virginia; Buckingham County, Virginia; and Northampton County, North Carolina. Dominion’s preferred route crosses national forests and parks, including the Appalachian Trail, and passes by private residences, putting all of these areas at risk of potential gas leaks and spills. In addition, compressor stations are known to emit air pollutants that are harmful or toxic to human health. Despite frequent claims by Dominion touting natural gas as a necessary “clean” and “low-carbon” alternative to coal, recent scientific studies have shown that once the significant methane emissions that typically occur during the extraction, production and delivery of fracked natural gas are taken into account, the greenhouse gas emissions associated with electricity generation from fracked natural gas are actually quite similar to those from coal. In fact, independent analysis of the ACP has estimated the pipeline will emit 67,591,816 metric tons of greenhouse gasses annually, or roughly the same as 20 coal plants or 14 million passenger vehicles. In order to put Virginia on an emissions pathway to avoid the most dire impacts of climate change, the most recent studies by climate scientists show that not only must we phase out coal within the next ten years, but we must rapidly transition away from fracked gas as well. 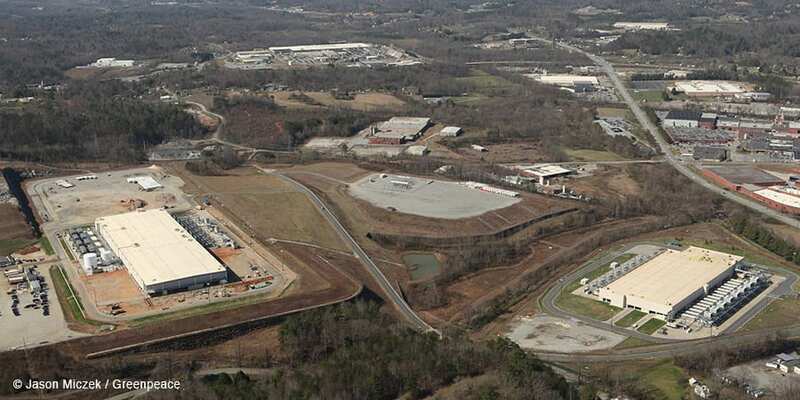 An aerial view of the Google data center in Lenoir, NC. This campus consists of two buildings housing data servers. Led by AWS’s dramatic expansion (see below), rising data center demand in Virginia has been used by Dominion to justify why the ACP is needed in Virginia, but Duke Energy in neighboring North Carolina is the next biggest investor in the ACP, and North Carolina is a hotbed of data center investment by internet giants such as Facebook, Apple and Google. While all five companies have a 100 percent renewable energy commitment, only Apple has had success matching a majority of its demand with a renewable supply of energy. For the other tech giants, the majority of the demand is continuing to fuel demand for fracked natural gas in the region. Amazon Web Services, the largest cloud company in the world, has made Virginia the center of its global operations, and most recently, the site of Amazon’s second U.S. headquarters. This combination and the sheer size of its energy footprint gives Amazon an outsized role to play in determining whether Virginia will put itself on the path to transition to renewable sources of energy in time to address climate change. Amazon currently has 55 data centers across 17 campuses in Virginia, with more expansion planned. The company is by far one of the state’s largest consumers of electricity. Is AWS Breaking its 100 Percent Renewable Commitment? However, unlike other IT leaders such as Apple, Google and Facebook that adopted 100 percent renewable energy commitments, Amazon has remained notoriously opaque when it comes to publicly reporting information about its current energy use and how fast it is growing, making it difficult to assess whether its large contracts for renewable energy were even keeping up with its rapidly growing data center demand in Virginia. As highlighted in our last analysis of Amazon’s data center demand in Virginia, Amazon’s dramatic growth continued to far outstrip its otherwise significant contracts for renewable energy. While Google, Microsoft and other IT companies with renewable commitments have struggled early on to keep up with rapid growth, Amazon appears to have gone the opposite direction. Though the company continues to chronicle its solar and wind projects on its website, Amazon has not signed any new contracts since November 2016 and has in fact withdrawn from a previously announced contract for a large new wind farm in Ohio. While AWS has signed contracts for six solar projects in Virginia, which along with its 72-megawatt Desert Wind project in nearby North Carolina deliver a total of 132 megawatts of renewable energy to the Dominion grid, Amazon has added 23 new data centers since 2017, representing an additional 626 megawatts of demand, with no additional renewable projects added. If Amazon were to operate its existing and planned Virginia-based data centers at full capacity 24/7, it could consume as much electricity annually as 1.4 million US homes, or more than the number of households in Chicago. In addition to AWS’s massive operations, Amazon is rapidly expanding elsewhere in Virginia, with the company’s recent announcement of locating “HQ2” in Arlington and Alexandria–or “National Landing,” as dubbed in the region’s bid. Over the next 10 years, Amazon expects to hire 25,000 people to work in National Landing and the company has already leased three office buildings and purchased two large plots of land. Despite the breadth of Amazon’s properties, from its data centers, to its headquarters, to its global fleet of trucks, planes, and delivery vans–the company refuses to report even the most basic data on its emissions or the contribution to climate change of its operations. For the more than one million companies, universities, government agencies and NGOs that rely on AWS data centers to power key pieces of their digital platforms, it may seem daunting to influence such a massive company. However, Amazon prides itself on being a customer-focused company, and customer pressure in the past is a big reason why it adopted a 100 percent renewable commitment. AWS customers should demand greater energy transparency and that AWS follow through on its commitment, as New/Mode recently did. AWS customers seeking to immediately reduce carbon emissions related to their cloud hosting could request to be hosted in Amazon’s California cloud, which is connected to a grid that is 50 to 70 percent powered by clean sources of electricity. Companies ready to break up with AWS, for its own broken commitment to renewables, can shift to a cloud service provider actively pursuing its renewable commitment, such as Google’s Compute platform or Microsoft’s Azure, and ask for details on which portion of their cloud has a renewable supply of electricity. 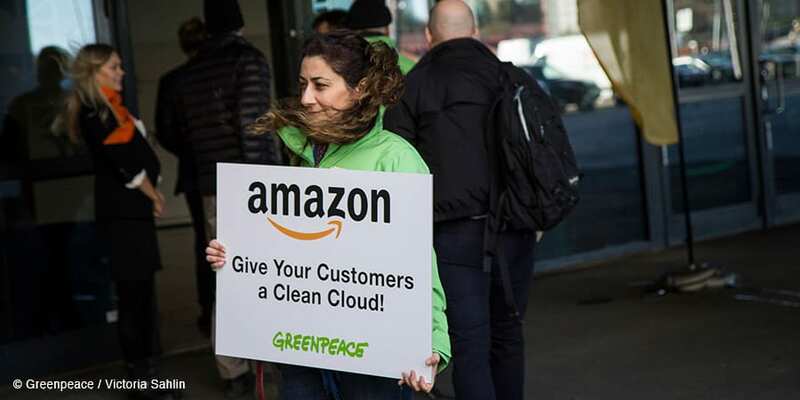 During a 2015 Amazon Web Services summit in Stockholm, Greenpeace Sweden asked AWS customers to demand the company "clean its cloud". Users of the internet platforms that rely on AWS also have a role to play in holding AWS to its commitment, which is to say, almost anyone who uses the internet since such popular sites as Netflix, Hulu, Slack, Pinterest, AirBnB, Yelp, Zillow, Expedia, instacart, DuoLingo, Soundcloud, the Weather Company and many more rely heavily or entirely on AWS, but may not be aware of the climate impacts of their hosting partner. Finally, Amazon Prime members, while not direct customers of AWS, can raise their voices as well to demand Amazon’s most energy-intensive subsidiary not give up on its renewable energy commitment. How Amazon powers its cloud has a significant impact on carbon emissions and climate change, which will impact everyone. Whether they are seeking to or not, data center companies in Virginia are already charting the state’s energy future with each new facility. Rather than allowing utilities like Dominion to use their tremendous growth to drive more dirty energy investments that are taking the state in the wrong direction, data center companies must become proactive both in driving the deployment of renewables directly, and also in supporting a rapid shift in state policy to support the aggressive deployment of renewable energy. Electric utilities in Virginia are given effective monopolies over the customers in their service territory, significantly limiting or removing any customer choice over the source of electricity powering their operations once they choose their location, and thus their utility. 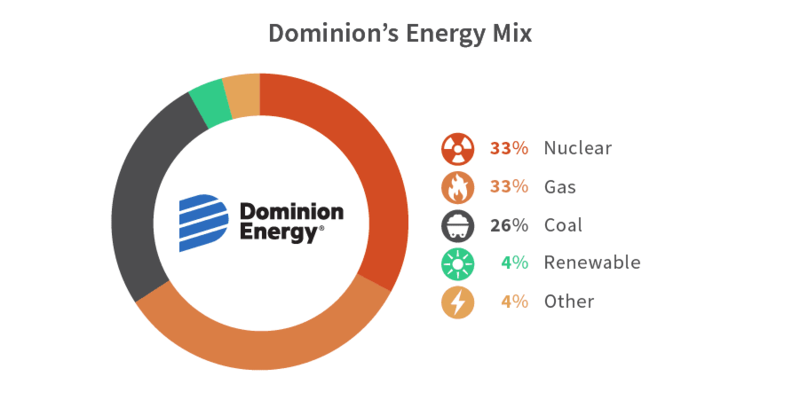 Like many other monopoly utilities, Dominion has moved very slowly to increase the amount of renewable energy it is offering, and what it has offered was done at a significant premium, despite the rapidly declining cost of renewables. However, there are important exceptions and other opportunities outside of the monopoly utilities to purchase renewable energy, as well as some emerging new pathways being offered by Dominion created in response to pressure from data center and other large corporate customers with operations in Virginia. Virginia state law allows customers to opt out of their monopoly utility service under two important exceptions: (1) to purchase 100 percent renewable energy if their local utility does not offer a 100 percent renewable energy service (2) Large customers (5 megawatts or larger) are also given the option to leave their local service, with the restriction that they would have to give a five-year notice before they could return, which has served as a strong disincentive for most companies. However, a recent decision by the Virginia Supreme Court clarified that the 100 percent renewable exception was available to large customers as well, creating an important new option for data center operators. Without further changes to the law, the 100 percent renewable pathway for data centers could again be limited if state regulators approve a 100 percent renewable service by the local utility, as data centers and other large customers would be required to again adhere to the five-year notice of return requirement. Appalachian Power Company (APCO) recently had its 100 percent renewable service approved, and Dominion has indicated it will soon resubmit its own proposal, after having previous versions rejected. In monopoly utility markets that have poor options for purchasing renewables directly, virtual or “synthetic” power purchase agreements (PPAs) allow companies to sign a long-term contract with renewable energy developers, but do not require the actual delivery of electricity to the buyer. Instead, the electricity is resold to the open market, with the buyer keeping any underlying RECs, which must then be retired. (See REC arbitrage, below.) If a company executes a virtual PPA (VPPA) in the same electricity market in which it operates a data center, then a VPPA can help add renewable energy and potentially displace demand for dirty energy on the same grid they have demand. VPPAs can provide the buyer an effective hedge against rising electricity rates from higher fuel costs, securing local RECs at a much lower price than if the project was contracted through a utility tariff. However, this also creates market risk if wholesale electricity prices decline below the contract price of the PPA. VPPAs have played an important role in cracking open difficult utility markets, helping back down the utilization of dirty energy generation on the grid. They create an indirect impact on shifting local utility investment plans away from fossil fuels, as they will not be incorporated by the local utility as a system resource. The rapid deployment of renewable energy and the stagnation of mandatory renewable energy targets in many states has created a large surplus of “naked” or unbundled renewable credits available at the national level for purchase by the voluntary market, driving their price to record lows, less than $1/megawatt hour. The minimal revenue generated from the sale of these credits does little to enable additional renewable energy projects or displace demand for dirty sources of electricity. REC arbitrage is a related lower impact strategy, which typically involves a PPA with a local renewable project, but whose RECs may be much more expensive due to higher demand from compliance obligations. Some developers will offer to sell the more expensive RECs from the project and “arbitrage” these credits by selling them and buying replacement RECs from a much cheaper national pool. While these credits can be used to “count” by corporations under current reporting standards, most IT brands have focused on higher impact strategies to purchase renewable energy on a bundled basis in the same region where they have operations. 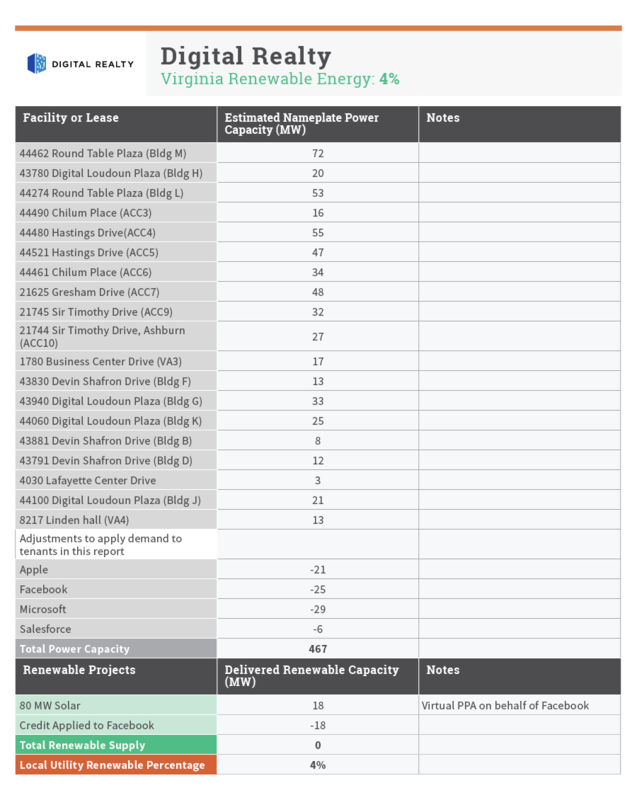 Schedule RF: The Renewable Facility tariff (Schedule RF) was initially created in response to the desire by Facebook to secure a supply of additional renewable energy to meet a new data center being considered near Richmond. Schedule RF is a voluntary program that allows new customers who are adding significant electricity demand to support the development of specific new renewable energy projects by signing a long-term contract to purchase the RECs associated with a new renewable project that are either built by Dominion or secured through third-party contracts. While customers get a guaranteed price for a REC purchase, they do not receive any other market benefits from these projects. In addition to their existing power supply contract, customers enter into long-term contracts to take the renewable energy credits (RECs) these new projects generate. Dominion ratepayers pay for and receive the electricity generated, treating it as part of its overall supply for Virginia, displacing the need for additional fossil generation due to the customers’ growth. Schedule MBR: The Market Based Rate (Schedule MBR) was initially designed as a special rate contract for one customer, Amazon Web Services, but a 200-megawatt pilot has been separately established for large high-load-factor customers only, such as data centers. By paying higher all-in costs via the MBR, customers who have signed VPPAs are able to better match their electricity cost against their VPPA contract, reducing some of the potential upside from a VPPA, but also reducing their exposure from a decline in energy price below their contracted strike price. The limited options and other barriers companies face in Virginia to purchase renewables has sifted companies in two buckets: those actually trying via existing tariff options and/or climate advocacy in the state, and those greenwashing by simply offsetting their Virginia load with generation from elsewhere or RECs. While tech companies have had some success in getting Dominion to take small steps toward making renewables more accessible to corporate buyers, it is clear from the rate of change and direction it has laid out in its IRP that Dominion is intent on keeping Virginians and the data center companies in the state locked into fracked gas and coal far beyond what climate scientists say is acceptable to avoid dangerous climate change. Tech companies must move to wield their collective political and economic influence much more aggressively, both with their suppliers and with policymakers in Richmond, to chart a rapid transition to renewable sources of energy. In addition to being Virginia’s largest utility, Dominion is also the single largest donor to political campaigns in the state, contributing over $10 million in the last decade, affording them significant influence over the state’s politicians and in particular members of Virginia’s General Assembly. Facebook, Google, Microsoft, Apple and Amazon have all repeatedly proven their skill in using their considerable leverage with policymakers to secure policy changes and economic incentives beneficial to their business before deciding to expand their operations, as recently witnessed with Amazon’s site selection process for its “HQ2.” In fact, data centers were again the largest category of tax abatement in Virginia during 2018, the result of a tax incentive package originally passed in 2009 following Apple’s decision to locate its East Coast data center in North Carolina rather than Virginia. With more than 100 large data centers, and counting, already operating in Northern Virginia, driving major new growth in electricity demand in the state, companies in Data Center Alley and elsewhere in the state have a unique responsibility to change the energy path the state is currently on, as well as a critical opportunity to ensure their investments hold value over time. 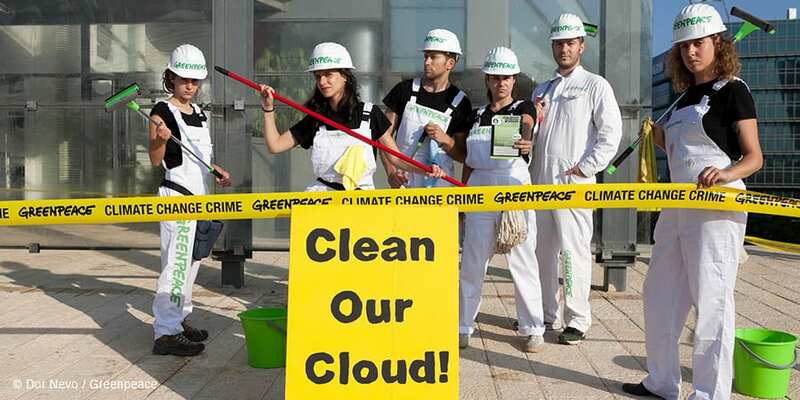 Greenpeace activists in Israel took action in 2012 to demand the world’s largest tech companies power their data centers with renewable energy. But, if the ongoing expansion in Virginia by Amazon and other major data center companies continues along the dirty energy path being offered, it will be seen as an indication that IT companies are not serious about their public commitments to renewable energy. This has the potential to create significant risk to IT company investments in Virginia and their brand equity as their discerning cloud or colocation customers take their business elsewhere. It will also serve as a validation of Dominion’s strategy to use data center demand to justify major new investments in fossil fuels that will mean much higher costs for all Virginians. These potential risks are not only real, but also imminent. However, rapid and significant intervention can still have success in preventing both business disruption and misdirected continuing investment in fossil fuels. Public commitments to renewable energy send a powerful signal to politicians and local utilities that access to renewable energy must be part of the package. As a group, the tech companies and data center companies have adopted strong commitments to renewable energy and have operations in Virginia with an aggregate projected demand of over 1.3 gigawatts. This demand would more than double to 3 gigawatts if Amazon’s cloud subsidiary would rejoin this group. Data center operators and customers with 100 percent renewable energy commitments have a uniquely strong standing to speak out against the ACP, both as major customers who do not want to pay for an unnecessary fracked gas pipeline that will not help them meet their renewable goals or meet customer expectations, and as a customer class being used by Dominion to justify its construction. The Virginia General Assembly plays a central role in setting state energy policy. Efforts to pass legislation to expand access to renewable energy, including competitive service providers offering renewable energy, are ongoing. However, a recent floor debate on energy legislation led to a vilification of California and other states that have set aggressive targets to transition to renewable energy, claiming they will result in rolling blackouts and would destroy the state’s ability to create jobs, with the exception of candlemakers. 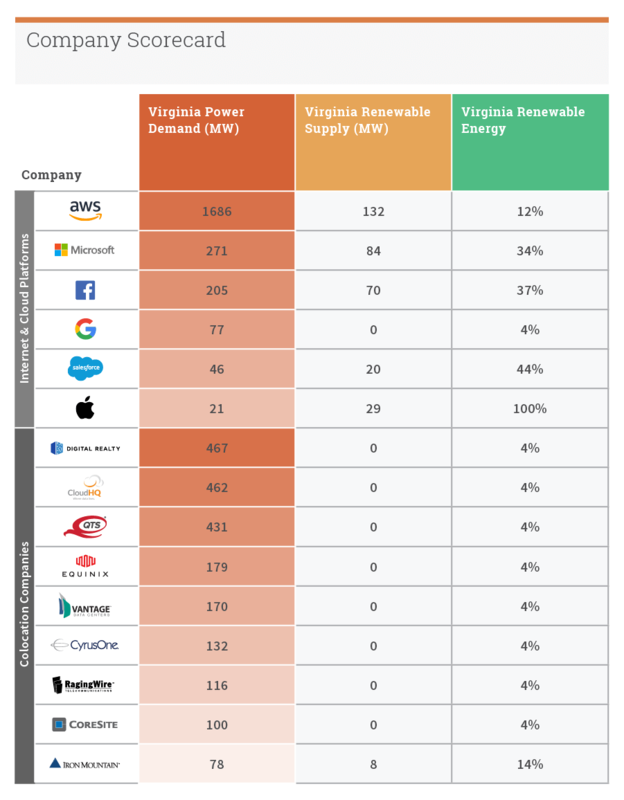 Many of the current members of the Assembly may benefit hearing from energy-intensive companies that transitioning Virginia to renewable sources of energy would make it much more likely to attract additional investment not only from the IT sector, but also from many other major brands that have set aggressive greenhouse gas reduction and renewable energy targets. If Dominion continues to keep its customers locked in to fossil fuels, make plans to leave Dominion’s grid or leave Virginia altogether, siting new facilities in states that are transitioning to renewable sources of energy. Wind turbines in Story County, Iowa. Iowa has become a data center hotspot where energy utilities have made significant new investment in renewable generation. Increasing attention is being paid to “green” and “renewable” efforts across industries. It can be difficult for even sustainability professionals to evaluate corporate renewable claims and their impact. In the tech sector, there remains a shortage of useful metrics and publicly available data to evaluate and compare the energy footprints of major internet companies and their respective data centers. This lack of data is not due to the fact that data does not exist; rather, many companies remain unwilling to provide basic information about both the amount and source of their growing electricity consumption. Since 2012, our Clicking Clean reports have attempted to shed light on the basic questions: How much dirty energy is being used to power the internet and which companies are choosing truly clean energy? This report attempts to provide a basic answer to this question in Virginia–the heart of the internet–based on what is provided by companies or gleaned from the limited information available and focusing on recent data center investments of select brands and the current clean energy supply associated with each investment. Starting with an initial set of some of the largest internet platforms, cloud providers and colocation companies with a presence in Virginia, Greenpeace identified two main inputs from a representative sample of their most recent (five years or less) infrastructure investments. 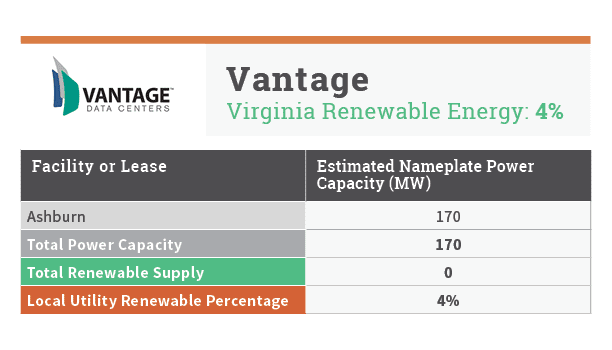 For each company in this report we calculated energy demand by adding up the total capacity of their Virginia-based facilities. To measure energy demand at the facility level we relied on company-reported information when available. Many companies still fail to report energy demand information at the facility level. In these cases, we used conservative estimates of the amount of backup generator capacity permitted for each facility as a proxy to calculate power capacity, reducing our estimates of the number of generators and overall capacity by 20 percent to account for redundancy. We obtained these permits via FOIA request to Virginia’s Department of Environmental Quality, Air Division. 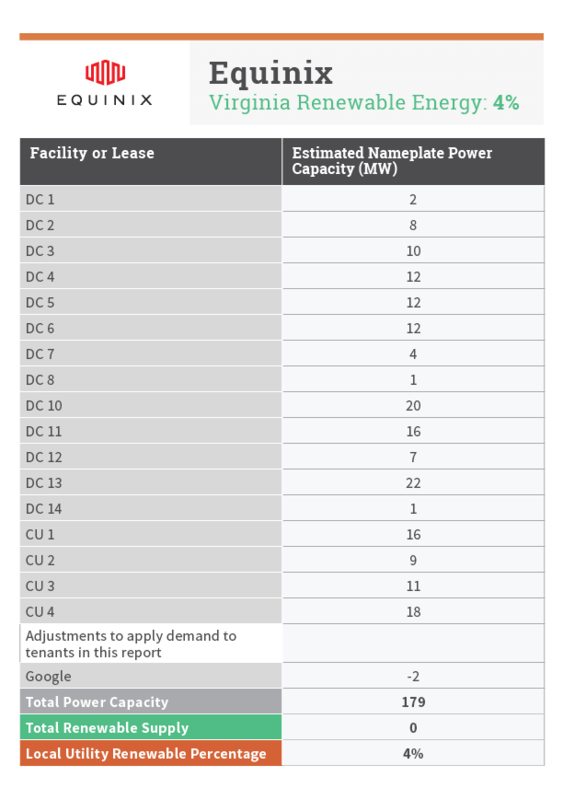 We used publicly reported information on large-scale colocation leases in Virginia to attribute this power demand from these leases back to the company leasing the space. We then subtracted this demand from the colocation company (if also scored in our report) to avoid double counting of overall megawatt demand. To determine the amount of renewable energy sourced by each company we relied on company-reported information and media reports about renewable deals in the region. For this assessment, we have counted solar and wind projects in Dominion’s territory in both Virginia and North Carolina. We used recent regional capacity factors (22 percent for solar, 34.6 percent for onshore wind) to adjust to appropriate renewable delivery levels. We then gave each company residual credit for the 4 percent renewable energy level of Dominion’s grid mix. While a number of the facilities in this analysis clearly fall outside Dominion’s service territory (primarily in NOVEC service territory) where the local utility generation mix is not certain, we have provisionally applied Dominion’s renewable residual level for such facilities in our analysis (instead of 0.05 percent RE for NOVEC, based on PJM residual levels), pending more detailed emissions information from the companies. Electricity demand derived by taking the announced size of investment and deriving total number of megawatts, using industry average cost per IT load multiplied by the published Power Usage Effectiveness(PUE) for facility or, if not available,1.3 for new facilities. When relying upon backup generator permits to calculate the estimated electricity demand of a facility, Greenpeace made conservative assumptions regarding the total power the generators are needed to cover, as well as the number of generators deployed for redundancy. This information is then used to approximate, initially on a facility level, the number of megawatts of clean energy the facility will consume. 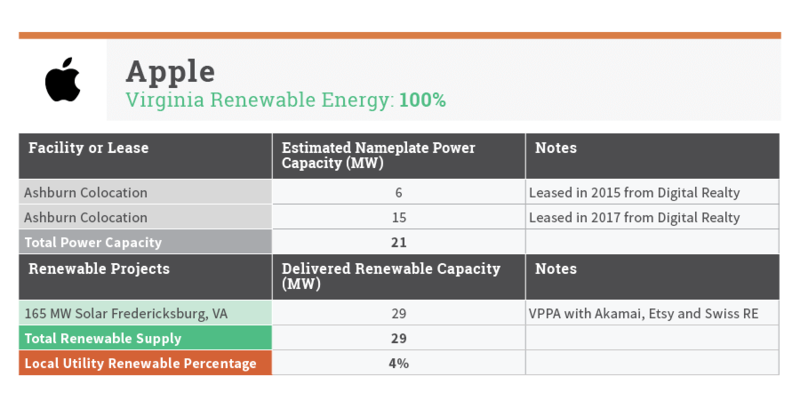 Having calculated a facility-level clean energy percentage, Greenpeace derives a company average of renewable percentage across its Virginia facilities. In compiling the information included in this report, Greenpeace contacted all companies featured and asked for information regarding their data center facilities and for information on their energy commitment and infrastructure siting, energy efficiency and mitigation efforts, renewable energy procurement and renewable energy advocacy. Where clear and consistent information was not provided by the company, Greenpeace made estimates of data center power demand available to companies for comment in advance of publication. Amazon Web Services (AWS), a subsidiary of Amazon, is the largest provider of cloud hosting services in the world, creating the “virtual” homes of more than one million customers. These customers include well-known video streaming sites such as Netflix, Comcast Xfinity, PBS and C-Span, media sites like the Hearst Corporation and the Guardian, and the web presence for government agencies such as the State Department, NOAA and the CDC. As of January 2017, our Clicking Clean report found that AWS operated 32 data centers in Virginia with a combined capacity of 1.06 gigawatts. 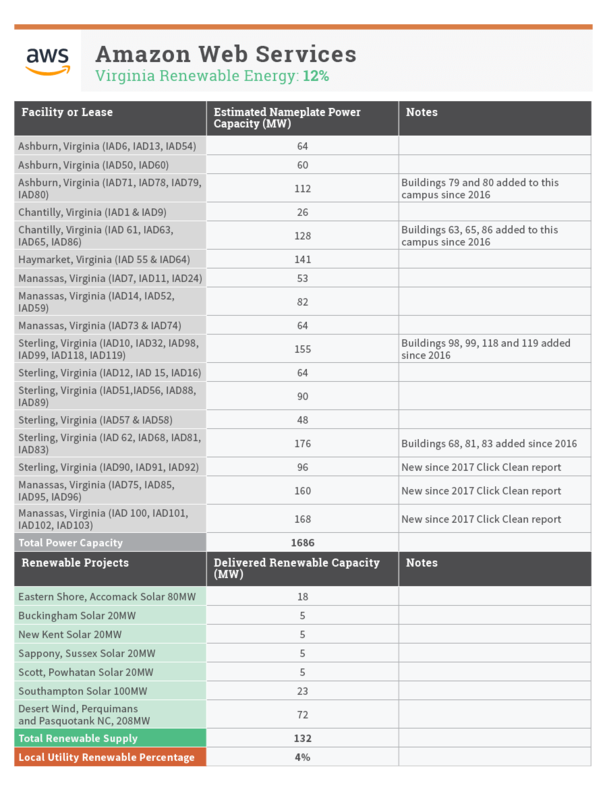 Our current analysis shows that AWS has built or been permitted for 23 new facilities in Virginia that will add 626 megawatts capacity when completed, representing a 59 percent growth in just over two years. AWS committed in November of 2014 to use 100 percent renewable energy for its global AWS operations. However, unlike other companies, AWS has not included a deadline to meet its 100 percent goal. In 2015 and 2016, AWS signed contacts for six solar projects in Virginia as well as a 72-megawatt wind project in North Carolina to deliver a total of 132 megawatts of renewable energy to the Dominion grid (which powers the lion’s share of AWS’s Virginia-based data centers). 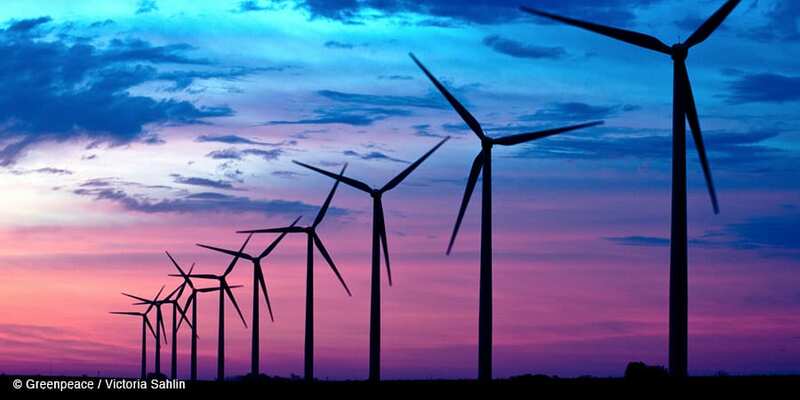 However, since November 2016, AWS has not signed any new renewable contracts anywhere and has in fact withdrawn from a previously announced contract for a large new wind farm in Ohio. While AWS continues to claim it reached 50 percent renewable energy usage in January 2018, the company has remained notoriously opaque when it comes to publicly reporting information about its current energy use and how fast it is growing, making it difficult to assess whether its contracts for renewable energy are keeping up with its rapidly growing data center energy demand. In Virginia, where AWS’s cloud touches the ground more than anywhere else, it’s matching just 8 percent of its demand with renewable power, for a total renewable percentage of just 12 percent. 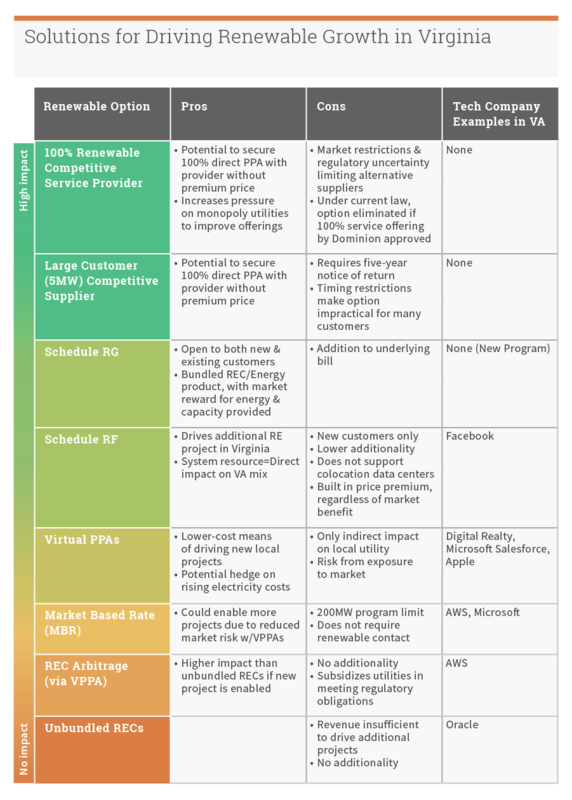 AWS did use its influence with Dominion to develop the Market Based Rate tariff (Schedule MBR, above) opening up a pathway for large customers to have access to market pricing and balance the use of VPPAs, However, AWS’s decision to continue its rapid expansion in Virginia without any additional supply of renewable energy is a powerful endorsement of the energy pathway Dominion has chosen, including the building of the ACP, and a clear signal that its commitment to 100% renewable energy will not serve as a meaningful basis for deciding how its data center are powered. In addition to a number of large data centers Apple owns and operates elsewhere in the U.S. and abroad, Apple digital offerings are also supported by colocation leases and cloud computing platforms, with significant data center operations in Virginia. Apple was one of the first tech companies to commit to power its data centers with renewable energy in May 2012. To secure a renewable supply of electricity for its Virginia operations (which include a 20-megawatt lease with a Digital Realty data center in Ashburn and retail stores in the region), Apple contracted for a 165-megawatt solar farm in Fredericksburg, Virginia, in partnership with Akamai, Etsy and Swiss RE. We have attributed 29 megawatt of delivered solar capacity for Apple’s portion of this virtual PPA. While Apple currently matches its colocation data center demand with an equivalent renewable energy supply, Apple has not taken responsibility for or reported the size of its use of AWS’s cloud platform based in Virginia, which appears to be significant based on the wide range of Apple services taken offline when AWS cloud services was disrupted in 2017. Despite its significant operations, Apple has yet to take an active role in renewable advocacy in Virginia, in contrast to its consistent efforts in neighboring North Carolina. In December 2011, Facebook became the first internet company to commit to power its online operations with renewable energy. In 2018, Facebook updated its commitment to include a 2020 deadline. 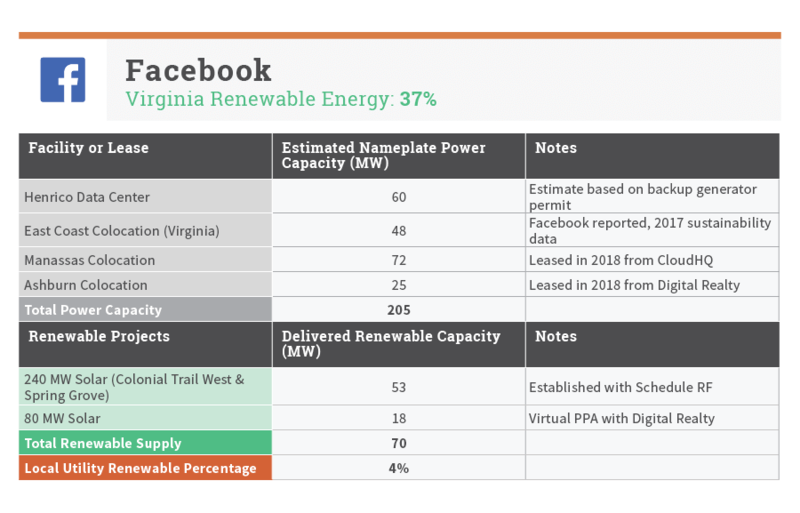 More than any other data center operator in Virginia, Facebook has demonstrated consistent effort to source renewable energy for its operation matching 37 percent of its contracted demand in Virginia so far. Facebook operates its own 60-megawatt data center in Henrico, Virginia, and has leases for 145 megawatts of colocation in Virginia. The company has sought out to match this load in two ways. First, Facebook worked closely with Dominion to establish a new renewable energy rate, the Schedule RF tariff for large buyers. (See Schedule RF above.) This tariff has led to the development of two solar farms, the 142-megawatt Colonial Trail West farm and the 98-megawatt Spring Grove farm, which will infuse the grid with 53 megawatts of renewable supply once constructed. To cover a portion of its colocation demand, Facebook worked with Digital Realty to secure a Virtual Purchase Power Agreement to develop an 80-megawatt solar farm (18 megawatts adjusted) within Dominion’s North Carolina territory. In addition to Facebook’s work with Dominion to create a new avenue for large corporate buyers to source renewables, Facebook has supported state-level advocacy work through its membership in the Advanced Energy Buyers Group. Google was the first IT company to directly contract for a renewable supply of electricity, signing its first PPA in 2010 in Iowa. Despite operating one of the largest networks of data centers in the world to power its search engine and other online services, Google has only recently had operations in Virginia’s Data Center Alley. 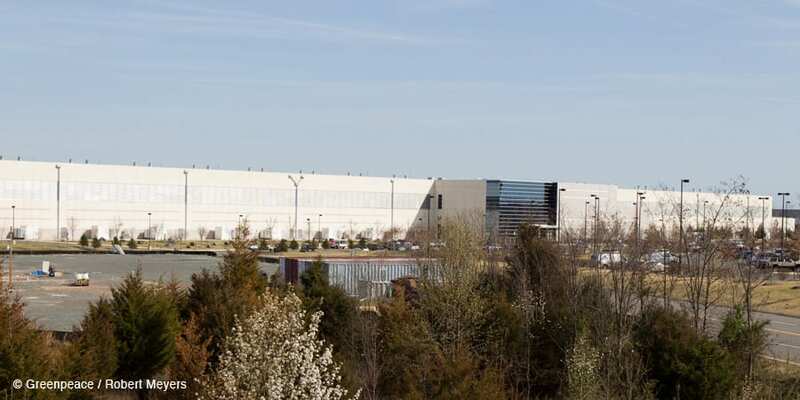 Google now has two data centers under development in Sterling, Virginia, and has two significant colocation leases in Ashburn to power the US-East4 region of the Google Cloud platform. Google has purchased over 2.6 gigawatts of renewable energy globally, giving it a strong claim to being the largest corporate buyer of renewable energy in the world. 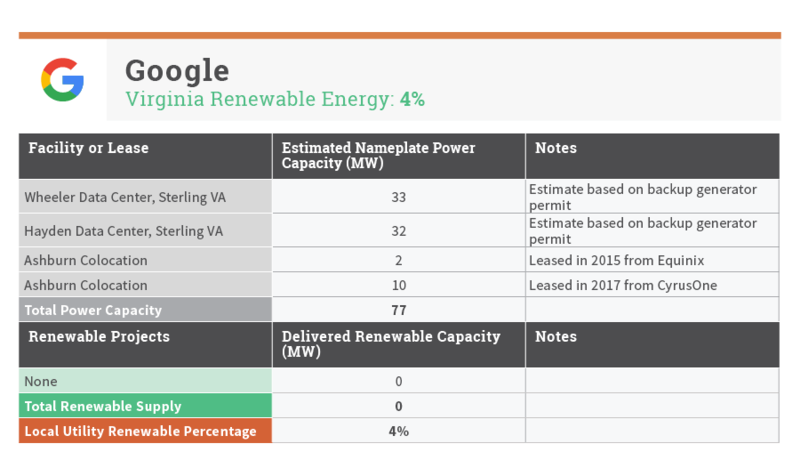 But despite recent creative claims of being “100 Percent Renewable Globally” from surplus supply of renewable credits in other markets, Google has not yet taken steps to add renewable energy to meet the demand of its data centers in Virginia. Google has been among the most active in supporting clean energy policies in other states where it has operations, particularly in neighboring North Carolina, but is yet to become directly engaged in shaping Virginia energy policy. In October 2014, Microsoft made a long-term commitment to use renewable energy for its data centers, with a short-term goal of 60 percent renewables by 2020. Microsoft is rapidly expanding its data center complex in Boydton, Virginia, and is leasing significant colocation space in Data Center Alley. 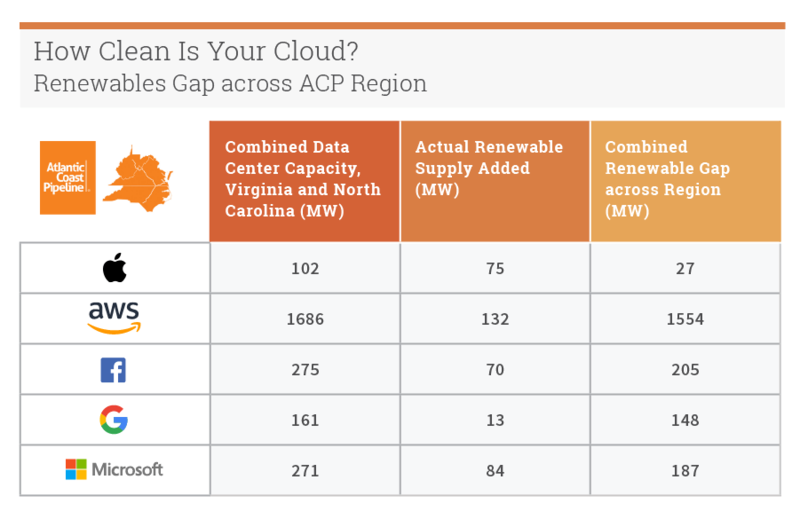 Just In the last year, Microsoft added 74 megawatts colocation capacity, bringing its total demand in Virginia to 271 megawatts. 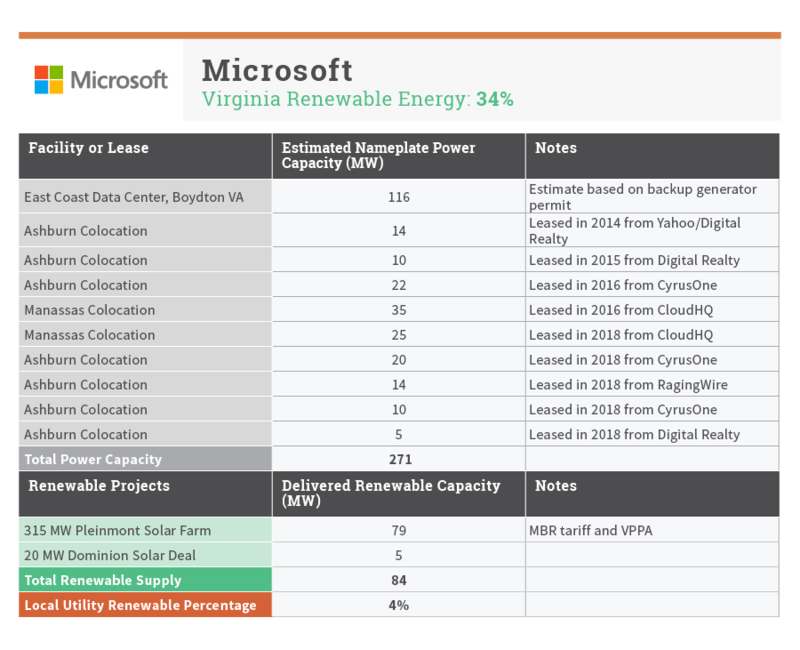 On the supply side, Microsoft has been one of the first users of the MBR tariff offered by Dominion to balance a virtual PPA agreement for 315 megawatts of a 500-megawatt solar project in Virginia. Microsoft has also been exploring the use of battery storage, rather than backup generators, at its Boydton data center, providing a dual benefit of reducing emissions and serving as backup storage for the grid it is connected to. In 2018, Microsoft publicly supported bills in the state that would advance customer choice in accessing renewable energy and reduce penalties for leaving the grid to pursue RE as well as reducing the required customer size from 5 megawatts to 1 megawatt to make renewables an option for more customers. Despite being one of the original software-as-a-service cloud platforms, Salesforce does not own or operate its own data centers, but instead powers the rapid growth of the Salesforce Cloud through large leases with colocation operators. Salesforce was the first major internet company that exclusively leased data center space to adopt a 100 percent renewable energy commitment in 2013. Salesforce has multiple data center leases in Data Center Alley, totaling 46 megawatts, including a massive new lease with QTS in its new Manassas data center. 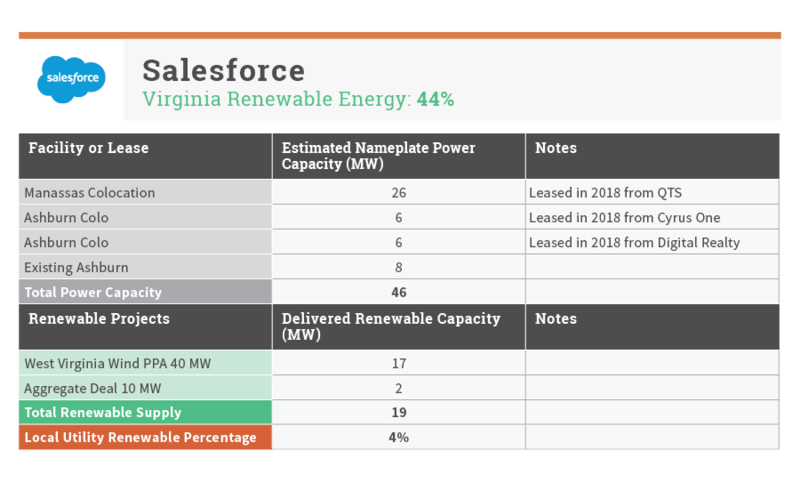 Salesforce appears to be evolving its efforts to purchase renewable energy toward higher-impact options from its first VPPA for West Virginia wind, as evidenced by the recent aggregation deal between Salesforce and four other companies for solar in Dominion territory in North Carolina. 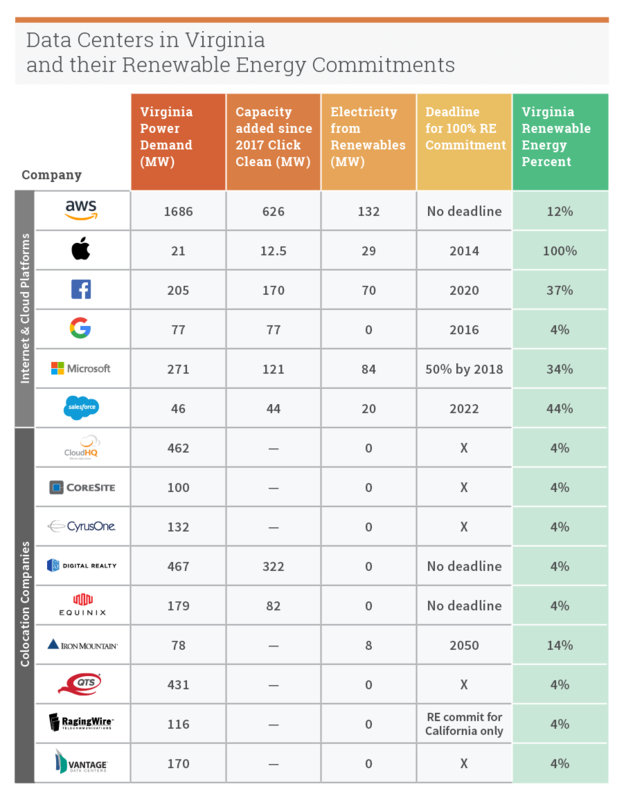 Salesforce has also been among the most active engaging in clean energy policy advocacy in Virginia, joining a September 2018 letter to Virginia regulators asking them to require Dominion to meet future demand with additional investments in renewables, following a similar letter in 2015. Founded in 2016 by the former CEO of Dupont Fabros Technologies (now merged with Digital Realty Trust), CloudHQ is in the process of rapidly completing two massive campuses in the heart of Data Center Alley (Ashburn and Manassas), with expected energy demand of nearly 600 megawatts when both are fully occupied. Competing with Digital Realty Trust as a wholesale colocation data center company, CloudHQ has secured large leases in Northern Virginia from internet giants with 100 percent renewable energy commitments: Facebook and Microsoft. CloudHQ claims to be connected to WindHQ, touting that it has just had a 164-megawatt wind project come online in 2017. However, the WindHQ project appears to be in Texas, far from Data Center Alley, and cannot feed into the Dominion grid or displace the demand for dirty energy these large facilities are creating. One of the larger retail colocation companies in the country, Coresite has 21 data centers across eight U.S. markets, including a campus in Reston, Virginia, that is expected to grow from two to five facilities to exceed 1.3 million square feet, and with an estimated demand exceeding 100 megawatts when fully completed. 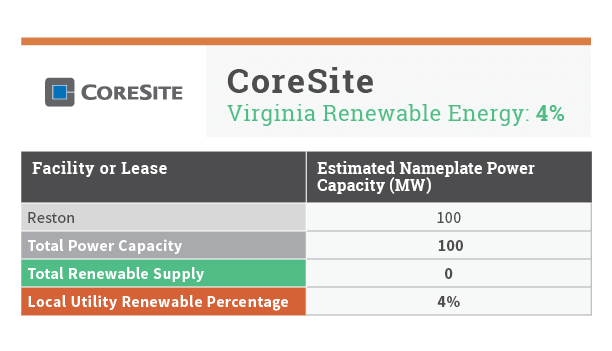 While Coresite has signaled to its investors that it expects to increase the amount of renewable energy it is purchasing, it has yet to secure a supply of renewable energy for its rapidly expanding Reston Campus. Operating 40 data centers across 11 U.S. markets as well as in the U.K., Germany, and Singapore, CyrusOne has rapidly grown to become one of the largest colocation operators since its founding in 2012. Like most of its peers, CyrusOne is in the midst of a significant expansion of its Northern Virginia campus, and is already one of Dominion’s largest customers, with power demand on track to reach nearly 200 megawatts. 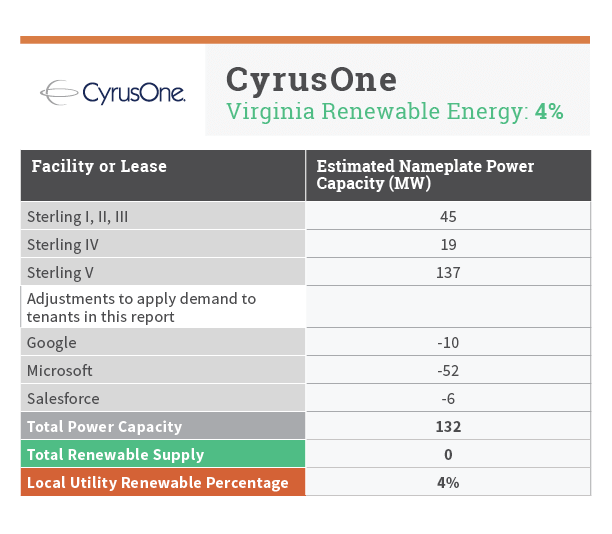 CyrusOne has recently secured significant leases for its Sterling, Virginia, campus from Google, Microsoft and Salesforce, all of which have 100 percent renewable energy commitments. Digital Realty Trust (DLR) is one of the largest data center operators in the world, operating nearly 200 data centers across twelve countries. DLR already operates two major campuses with 17 active facilities in Data Center Alley following its $7-billion merger with Dupont Fabros Technologies and has recently acquired additional land to support a third campus. Both DLR and Dupont Fabros Technologies were top-20 customers of Dominion in 2018. DLR adopted a long-term 100 percent renewable energy goal in 2016 and has contracted for renewable supply in several US markets outside Virginia. However, DLR recently entered into an 80-megawatt solar VPPA to cover the energy demand in Virginia of one of its largest customers, Facebook. Despite its massive size in Virginia, and in contrast to Equinix, DLR has not been visible in calling for Dominion to shift its energy mix away from fossil fuel to renewables. Along with Digital Realty Trust, Equinix is one of the largest data center operators in the world, with its business primarily oriented toward retail colocation leases. Equinix was the first colocation company to adopt a 100 percent renewable energy commitment in 2015 and has made progress in securing a supply of renewable energy for a select number of its sites. However, its Northern Virginia operations remain one of its fastest growing markets, with a 50 percent increase over the past two years, with no additional supply of renewables beyond the 4 percent offered by Dominion. To their credit, like Salesforce, Equinix has again weighed in with state regulators asking that they require Dominion to meet future demand with additional investments in renewables and not permit further investments in fossil fuels. Although better known for its document deep storage business model, Iron Mountain has rapidly built up its fleet of data centers through a series of acquisitions (including IO and FORTRUST) and has also built a new hyperscale data center in Manassas, with a projected demand capacity of under 80 megawatts when completed. Iron Mountain recently adopted public commitments to 100 percent renewable energy for all of its operations and now claims its data centers are already 100 percent renewable. However, it is not clear by what means it is able to make such a claim given the renewable deals announced and the locations of its data centers. 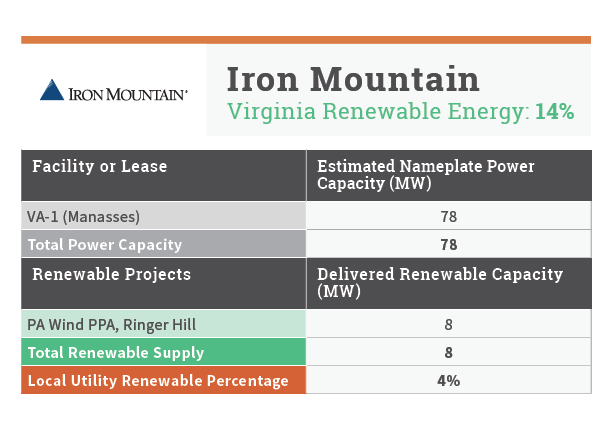 Iron Mountain has contracted for 8 megawatts of wind-powered electricity from nearby Pennsylvania that is connected to its Manassas facility via the PJM regional grid. Greenpeace will provide a full evaluation of Iron Mountain’s data center operations in the next global version of Clicking Clean. QTS operates several of the largest colocation data centers in the U.S., and has begun rapidly expanding its presence in Virginia. QTS has four large data centers in Northern Virginia and two near Richmond, bringing its aggregate power demand in the state to well over 400 megawatts, once fully occupied. 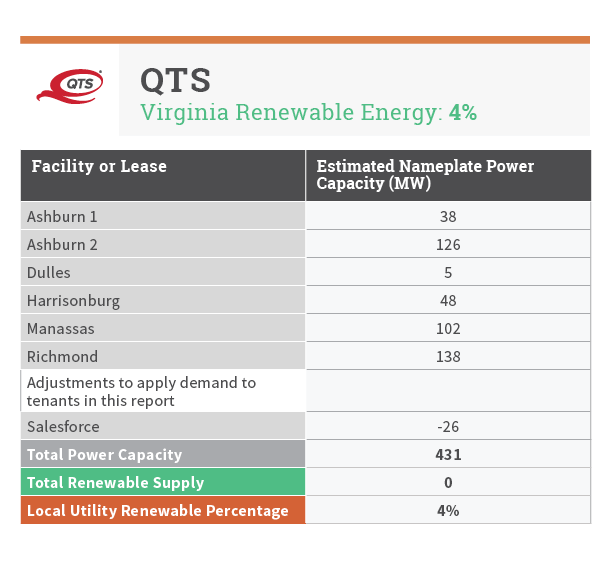 QTS has been successful in securing a renewable supply in several other markets where it operates data centers, but its massive data centers in Virginia remain tied to the dirty energy mix offered by the incumbent utilities. Greenpeace will provide a full evaluation of QTS operations in the next full version of Clicking Clean. Now an NTT Subsidiary, RagingWire operates nine data centers in four major U.S. markets. RagingWire has three existing facilities operating in Ashburn, with two additional data centers under development on their Ashburn campus. RagingWire has secured 100 percent renewable energy supply for customers in its West Coast campus in Sacramento from its municipal utility. We will provide a full evaluation of RagingWire operations in the next full version of Clicking Clean. 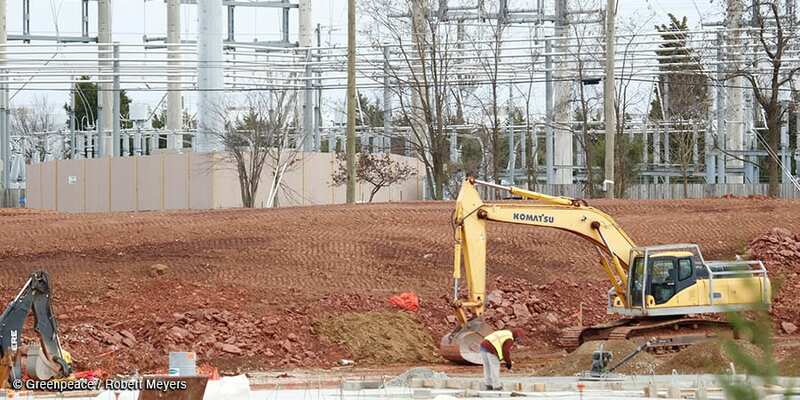 While Vantage is one of the newest data center operators to Data Center Alley, breaking ground on a $1-billion Ashburn campus in March 2018, it may soon be among the largest, with an estimated demand of approximately 174 megawatts if fully completed. We will provide a full evaluation of Vantage operations in the next full version of Clicking Clean. 2. See Virginia Electric Power Company, Form 566(2018) of Federal Energy Regulatory Commission which lists top 20 electricity customers, includes five data center companies with 100 percent RE commitments: Amazon, Digital Realty, Dupont Fabros Technologies (now merged with Digital Realty) Equinix, and Microsoft. 3. Apple and Salesforce do not operate their own data centers in Virginia, but have significant leases with colocation data centers and utilize cloud computing services operating in the state. 9. EIA. 1.6 percent overall generation came from solar and hydro; none came from wind. 17. Dominion’s 2017 Ferc Form 566, which lists top 20 customers for the past three consecutive years, includes six companies with 100 percent RE commitments: Amazon, Digital Realty/Dupont Fabros Technology, Equinix, Microsoft, Walmart. 27. Aggregate solar supply of 60 megawatts based on combined nameplate capacity of 260 megawatts, with a 23 percent capacity factor. 72 megawatts of added wind capacity based on 34 percent capacity factor on 208 megawatt nameplate capacity of project. 28. Average annual electricity consumption for a US residential utility customer was 10,399 kilowatt hours, according to Department of Energy, 2017. 45. Customers must have 5-megawatt peak demand, with load factor of at least 85 percent. 51. Represents combined demand of Apple, Digital Realty, Equinix, Facebook, Google, Iron Mountain, Microsoft and Salesforce. 68. S.B. 837 and H.B. 1528. Public letter of support sent Feb 5, 2018. Authored by Gary Cook and Elizabeth Jardim. Designed by Kelly Horigan and Jacob Hardbower. For information regarding this report, please contact Elizabeth Jardim, Senior Corporate Campaigner, at ejardim@greenpeace.org.